Yahoo! 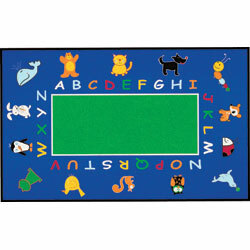 I just found out that some generous donors have funded my request for a classroom rug. I am so excited. I purchased a set of foam mats for the floor this year and the kiddos have just about picked them to pieces. I cannot wait until August when the new rug gets delivered. This is what the rug will look like when it gets here. Yea for us! I encourage all teachers to sign up for DonorsChoose.org. I have a button to the site at the bottom of the blog. This is the second project since Christmas that I have gotten funded. This really helps out the classroom and lets others contribute to what we need most.